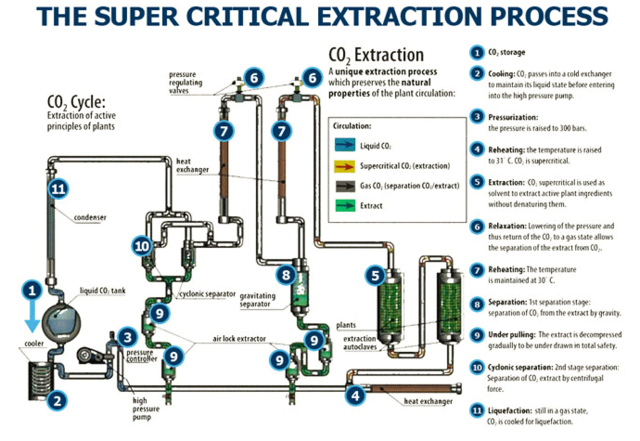 Supercritical CO2 Extraction | Why use a CO2 Extractor? Co2 extraction is a great way to dissolve lipophilic non-polar molecules such as cannabiniods. It utilizes supercritical co2 as a way to extract organic compounds from a given substance. When co2 enters the supercritical phase of matter it’s physio-chemical properties become unique. Supercritical co2 behaves as though it is both liquid and gas at the same time, giving it the beneficial solvent properties of both phases. Due to the low temperature of the process and the chemical stability of co2 many compounds are extracted in their original form and not denatured or oxidized. Bringing co2 to the right temperature and pressure brings it to a supercritical state. From there the molecule is exposed to a given sample. Since the co2 is supercritical it takes on the properties of both a gas and a liquid, allowing the solution to have low viscosity and high density respectively. Since the solution is supercritical, it is not restrained to the vapor-liquid phase boundary, thus there is no intramolecular attraction among the molecules to the interior of a liquid. In addition due to the mole fraction solubility of co2, at supercritical phase it has a high density allowing the solubility of volatile liquids and solids to dissolve easily. All of these properties together make co2 a great choice as a solvent for extracting organic molecules. What are the benefits compared to BHP, PHO, Alcohol, etc? Co2 is a great solvent in that it is completely non toxic and evaporates from the sample leaving hardly any residue. The process is low temperature and co2 non reactive allowing the extraction to maintain the large majority of its original native properties. Co2 is also non flammable and not subjected to high temperatures to risk accidental burning. The co2 extraction process is also much faster than organic solvent based methods, 10-20x faster. Co2 extractions are not good at extracting polar hydrophilic molecules due to it’s physio-chemical properties at supercritical phase. Also the equipment and technical ability to keep co2 at such a high pressure needed for the reaction is hard for most people to obtain. Several things are necessary to make a co2 extractor run well. Depending on the size of the set up the exact equipment will be different. You will need a way to both cool and heat the co2, usually done with an electric heater. Pressure sensors and regulators are also important for the process, such as a back pressure regulator. In addition, reaction vessels thick enough to withstand the high pressure are important, as well as co2 pumps to bring and pressurize the co2 against the sample. Extractors come in all sizes from desktop size to a whole room depending on your needs. From 5L extraction vessels to 60L. How much material can they run? An extractor with a 5L extraction vessel can process 2.5lbs of material. A 20L can do 10 lbs, and a 60L can process 30lbs. Costs can range anywhere from 80,000 to 700,000 depending on the size of the extractor and it’s capabilities.